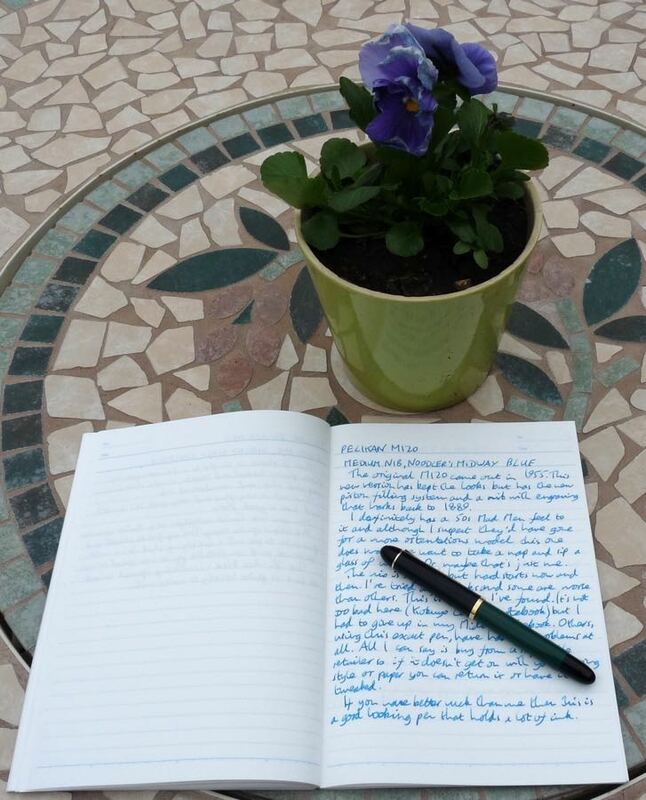 Pelikan M120 Fountain Pen Review – Pens! Paper! Pencils! The original M120 was released in 1955 as a school pen. This reissue keeps the same design but includes a modern piston filling mechanism and has a nib that is etched with a pattern from 1889. 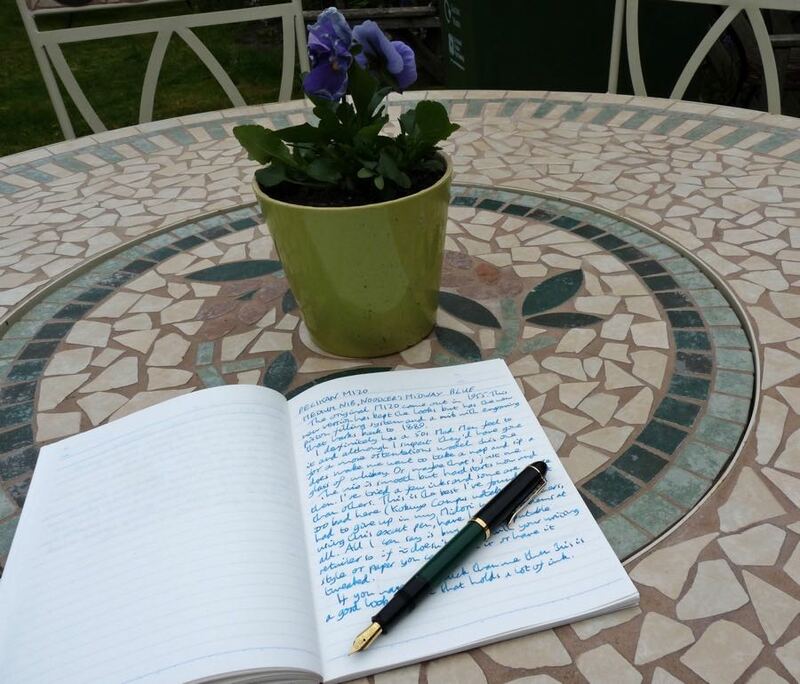 Thank you to Pure Pens for lending me this pen in exchange for a fair and honest review. 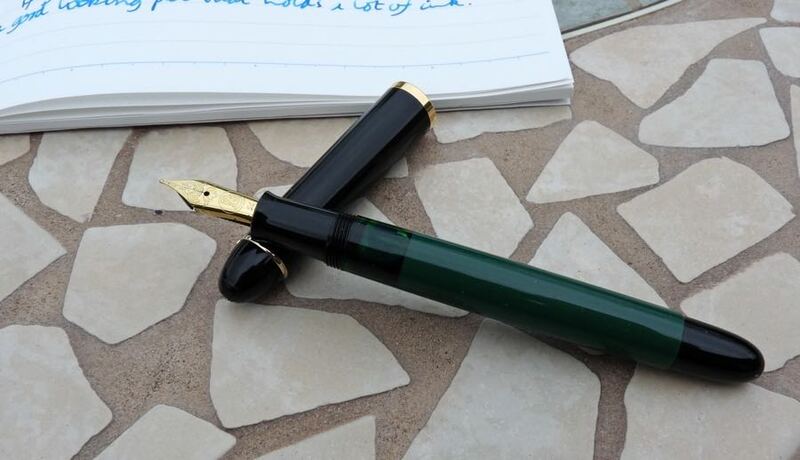 If you’d like to know a bit more about the heritage of this model then have a look over on the wonderful Pelikan’s Perch website. 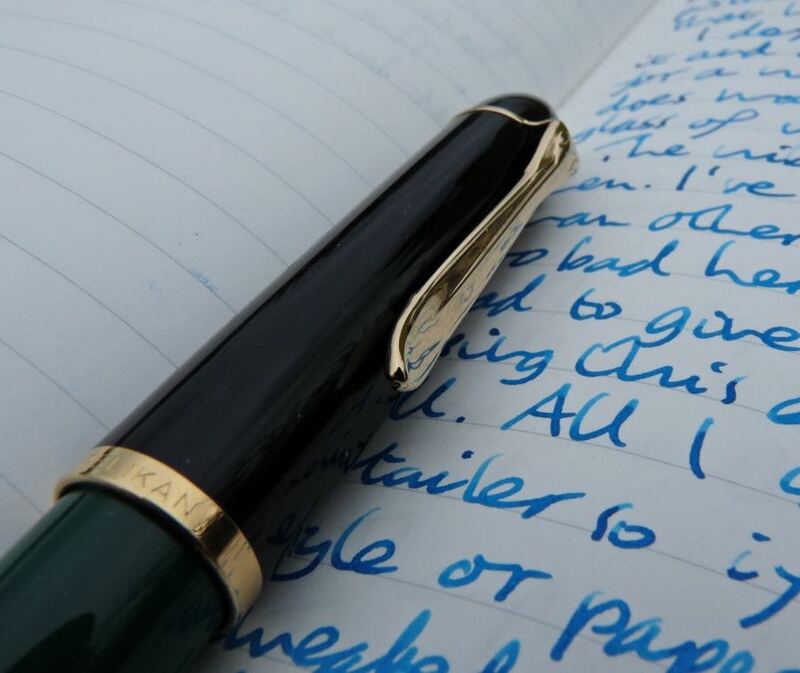 This is a fantastic resource for all things Pelikan. The M120 is a small light pen. I have big hands but found this to be comfortable even unposted. However it posts securely if you prefer. The piston filling mechanism is smooth and enables the pen to hold a good amount of ink. The transparent green window above the section gives you an easy view of the amount of ink you have left. The metal clip is quite strong and has the classic Pelikan’s beak design. The cap is different to modern Pelikan designs, which tend to have a flat end with the Pelikan logo on it. The overall effect of the design is just what, in fact, it is: a classy looking pen from a bygone age. I think it looks great: very Mad Men, which is a good thing, although of course I don’t suppose that lot would have used a pen with a steel nib. 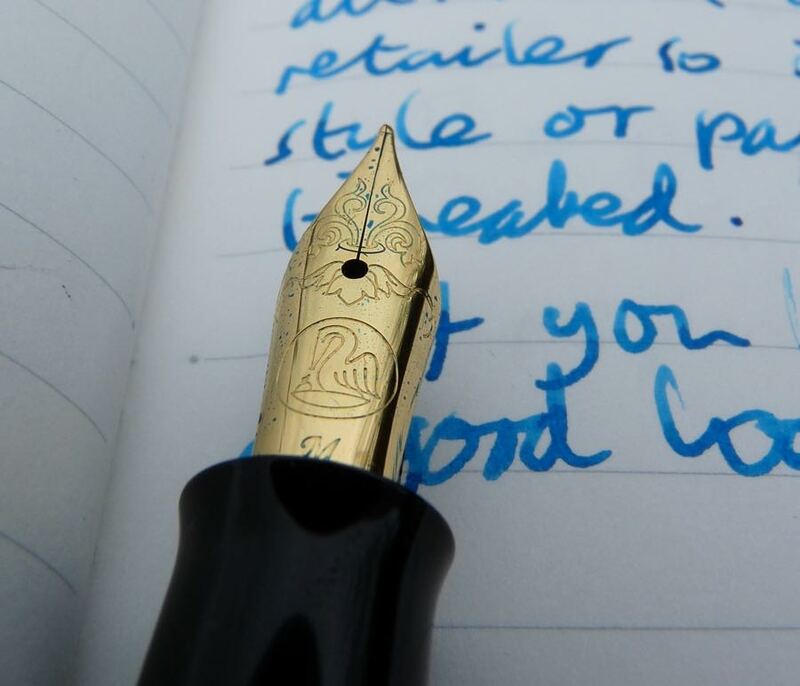 The nib: it’s gold-plated steel and according to Pelikan features “an engraving on the nib that re-interprets a curlicue which we found in a Pelikan price-list of 1889”. I’ve had problems with it. My day-to-day notebook of choice is a Midori MD notebook. This has smooth paper that is very well behaved with fountain pens. I first inked up the M120 with Pelikan Edelstein Amber and it skipped so much in the MD I had to give up completely. Edelstein Amber is a very dry ink so after checking with Scribble, who had tried this same pen before sending it on to me, that he hadn’t had any problems, I put Noodler’s Midway Blue into it. It was better but still not great in the MD. 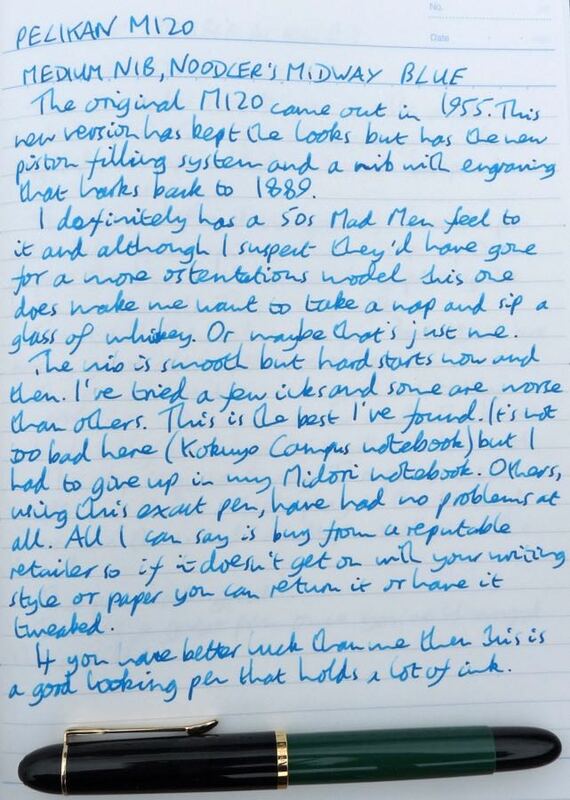 I tried on other paper but as you can see in the handwritten review it’s still not quite as it should be. I like the design of this pen but it’s not useable for me as it is. 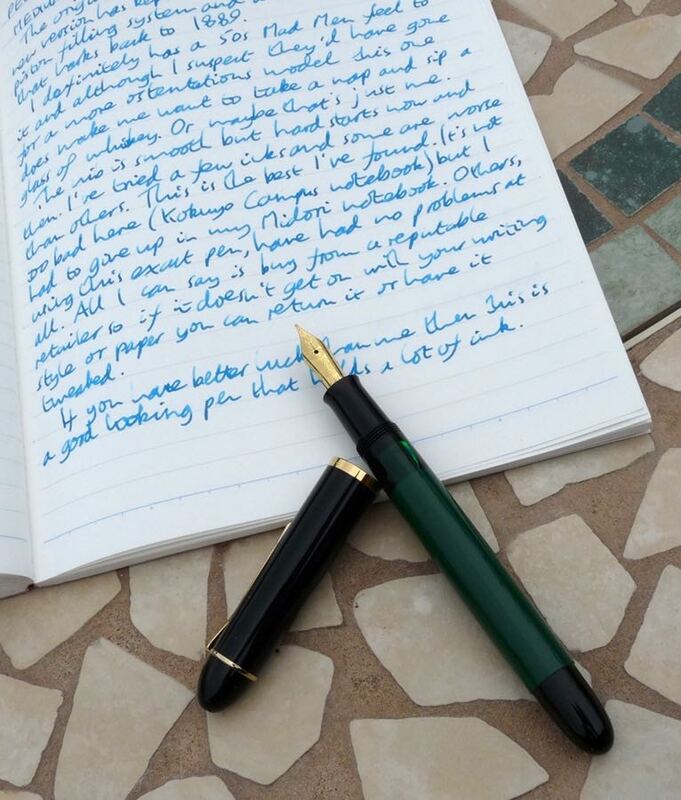 Looks like a lot of people who claim to be FP experts is misinterpreting info from Pelikan.com and keep repeating that original was not a piston filler. This is really disappointing. Anyone with the faintest knowledge on FP history will now that M120 was a piston filler. While I don’t claim to be a fountain pen historian, I didn’t say the original wasn’t a piston filler. 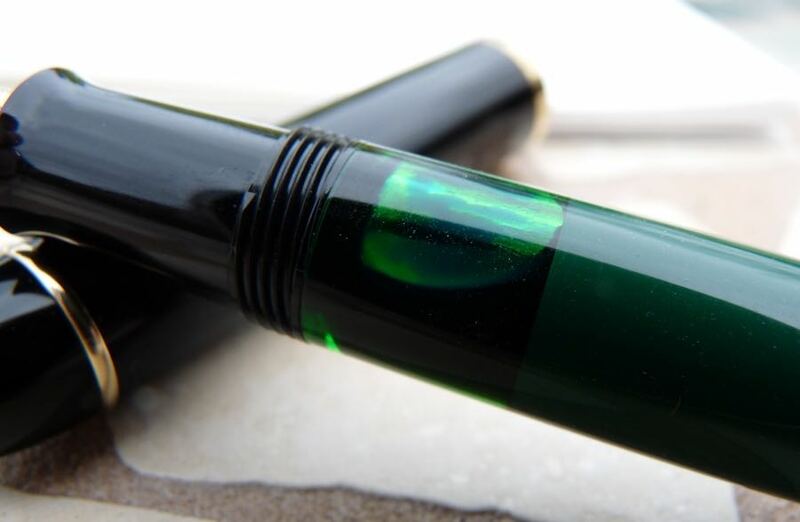 I actually link to Pelikan’s Perch which has a great article about the original pen, including mention of the piston filling mechanism.